Passengers waiting for a WestJet Newfoundland-bound flight at Toronto’s Pearson International Airport didn’t let a little delay get them down. 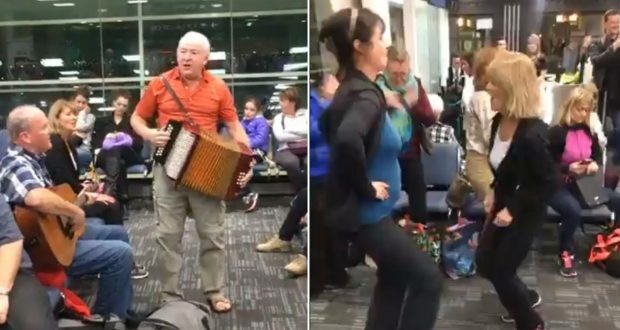 When the passengers from Newfoundland were told their WestJet flight from Toronto to St. John’s was delayed by about 30 minutes, one pulled out his accordion and another opened his guitar case. Within minutes, enthusiastic passengers were up dancing, singing and clapping to the tunes, which included Grey Foggy Day, Sweet Forget Me Not, and Music and Friends. Michelle Sacrey Philpott posted a video on Facebook of the spontaneous fun affair which has gone viral online with almost 360,000 views. “This is just one of the reasons why we are proud to be a Newfoundlander,” she wrote on the post. Sean Sullivan, who played the guitar, told the St. John’s Morning Show the WestJet captain was also singing along and that most people appreciated the entertainment after hours of travel. “We knew he (accordion player Sheldon Thornhill) is a good singer so he came over and did a couple of solos on his own so that made the occasion all that much sweeter,” Mr Sullivan said.